"I pledge my head to clearer thinking, my heart to greater loyalty, my hands to larger service and my health to better living for my club, my community, my country and my world." 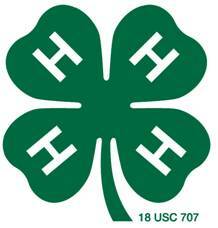 The Moe 4-H Club was organized July 11, 1928. It was one of the first clubs in the western part of the country. It's membership included children from Moe, Holmes City, Brandon, Urness and Solem Townships. In 1957, the club held a reunion for all members. August 13, 1978, Moe celebrated its fiftieth anniversary at the Moe Town Hall. The Conrad Hanson and Orlander Sletto families are third generation Moe 4-H families. Meetings: Second Monday of each month at 7:30 p.m. at Grace Lutheran Church in Brandon. The Moses and Aaron 4-H Club came into existence on January 5, 1953. The club started with 13 members through the efforts of the Millerville Farm Bureau. The club met in the homes of parents in the early years. Meetings generally opened by reciting the pledges and singing several songs. The favorites were "America", "A Song of the Open Country", "Long, Long Ago" and "America, the Beautiful." Meetings: Third Sunday of each month at 7:00 p.m. at the Millerville Fire Hall. Brandon Happy Knoll 4-H Club began as the Brandon 4-H Club in 1926. The first meetings were held at School District 82, which was known as the Happy Knoll School. In 1940, the Brandon Club changed its name to Brandon Happy Knoll. Its meetings continued to be held at District 82 but often met in the homes of members, then later at the Brandon City Hall. A charter was awarded by the U.S. Department of Agriculture to Happy Knoll 4-H Club in recognition of its organization as a Standard 4-H Club in 1945. Meetings: Second Monday of each month at 7:00 p.m.